I love cats. This has been established. When I saw that T.S. 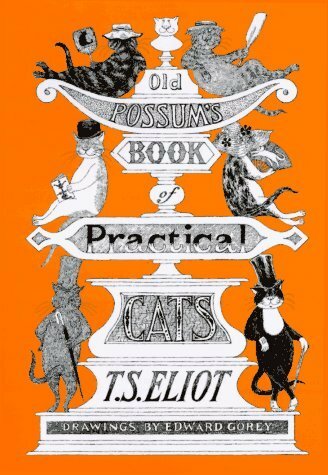 Eliot had a book of poetry entirely dedicated to cats (with Edward Gorey images to boot), I lost my little mind. So, here are some cat poems by T.S. Eliot to enjoy on a beautiful Sunday! Her coat is of the tabby kind, with tiger stripes and leopard spots. She sits and sits and sits and sits–and that’s what makes a Gumbie Cat! Then the Gumbie Cat’s work is but hardly begun. She tucks up her skirts to the basement to creep. She teachs them music, crocheting and tatting. Her equal would be hard to find, she likes the warm and sunny spots. She sets right to work with her baking and frying. And a beautiful fry of lean bacon and cheese. To prevent them from idle and wanton destroyment. And she’s even created a Beetles’ Tattoo. On whom well-ordered households depend, it appears. Buy Old Possum’s Book of Practical Cats on Amazon.